Ethel Burnet Clark, Dumbarton Oaks’ first rare book librarian. 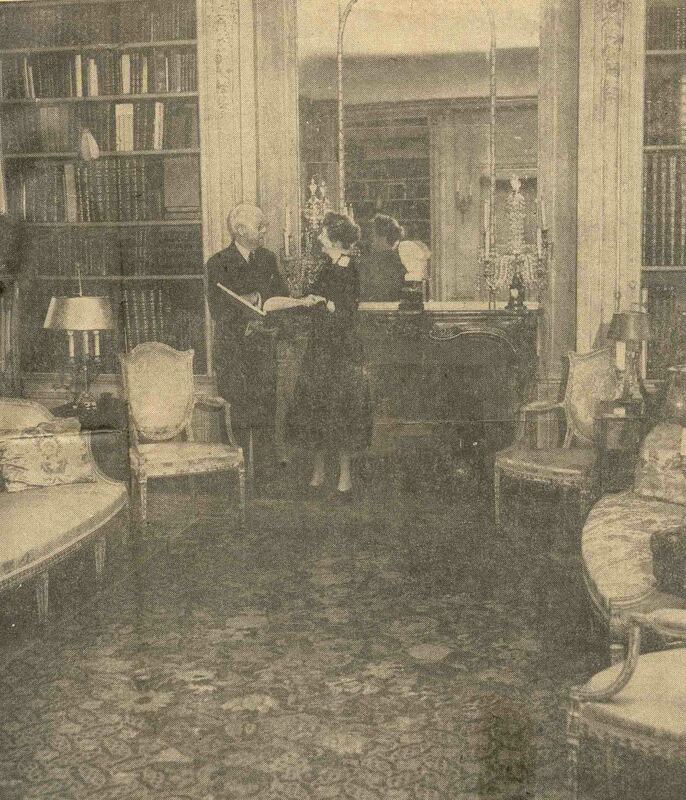 A devoted bibliophile and longtime friend of the Blisses, Ethel Burnet Clark helped Mildred Barnes Bliss catalog the Blisses’ personal library before the transfer of Dumbarton Oaks to Harvard University in 1940. After the transfer, she served as keeper of rare books from 1940 until 1944, when she reached mandatory retirement age. Highly knowledgeable about the rare holdings of Dumbarton Oaks, Clark published occasional essays on the collection, such as Chronicles of Froissart at Dumbarton Oaks, in 1947. Particularly close to Mildred Bliss, Clark wrote to her frequently and enthusiastically, often compiling extensive accounts of events at Dumbarton Oaks. While the Blisses were in California, after they transferred Dumbarton Oaks to Harvard in 1940, Clark helped to generate the Underworld Courier, a short and sometimes tongue-in-cheek summary of events taking place at Dumbarton Oaks (see post). Mildred Bliss commented encouragingly on both the “versatile informativeness” and “feather-pated folly” that characterized the publication. In a letter written to Mildred Bliss, Clark expressed how fond she had become of writing for the publication, noting that after it ceased, she had been “lonely” without it, as her “heart had been kept warm and young” as a result of the “pleasant exercise of weaving” pieces for it. During her time working for the Blisses, Clark contributed much to the growth of what came to be called the Founders Room collection. Working with all forms of media, including books, manuscripts, letters, photographs, and even 78 rpm vinyl records, Clark was responsible for cataloging a significant portion of both the Blisses’ personal holdings and Mildred Bliss’ Garden Library Rare Book Collection. Beyond cataloging, she took responsibility for the acquisition of new rare books and miscellaneous other library matters. As such, she frequently interacted with book dealers, collectors, and authors to obtain new works. She also dealt with what she called the “exciting challenges” relating to the functioning of the library. Some of these challenges included rebinding library books, devising and mounting bookplates, and “sensibly and efficiently” organizing the location of books in the rooms at Dumbarton Oaks. She assisted in the binding of 388 volumes during her time working in the house bindery, from 1940 to 1942. In 1943–44, Clark supervised a volunteer group that assisted the Arts and Skills Corps of the American Red Cross. This group took equipment and supplies to the Forest Glen Hospital, an annex of the Walter Reed Hospital, where they taught convalescing soldiers the art of bookbinding. She was strongly affected by the Second World War and strove to serve the nation’s war effort as best she could. She attempted to qualify for the cipher and code division of the Office of Naval Intelligence. In a letter to Mildred Bliss, Clark revealed her diligence in preparing for the “aptitude” exam: “Often I reluctantly put away my pads and pencils at midnight and later jump out of bed because a possible solution has flashed across my brain.” Clark contributed her time and effort as well to several book sales organized to raise funds for American troops. Having happily worked to catalog and build the libraries at Dumbarton Oaks, Clark only surrendered her position because she had reached the age at which Harvard required retirement. A year before, Clark had commented on the “sorrow” of her predicament, especially after learning that she had no chance of being “an exception” to the retirement age after several conversations with “gentle and compassionate” John Thacher, the first director of Dumbarton Oaks. Nonetheless, Clark was able to remain at Dumbarton Oaks after her official “retirement,” under the title: “Keeper of Rare Books, Emerita.” In this capacity, Clark continued her work at Dumbarton Oaks and received a small monthly pension in addition to living quarters at the Acorn House, a small cottage on the Dumbarton Oaks property. Later, in the 1960s, she also helped catalog the Mary Mellon collection of books and manuscripts on alchemy and the occult, which Paul Mellon then gave to Yale University.